Arya College of Engineering and IT (ACEIT), Jaipur is one of the leading institutes of national significance. It was established in the year 2000 under the auspices of Mr. T. K. Agrarwal from All India Samajis Society of Higher and Technology Education. The college has been accredited by NAAC and has been approved by AICTE. 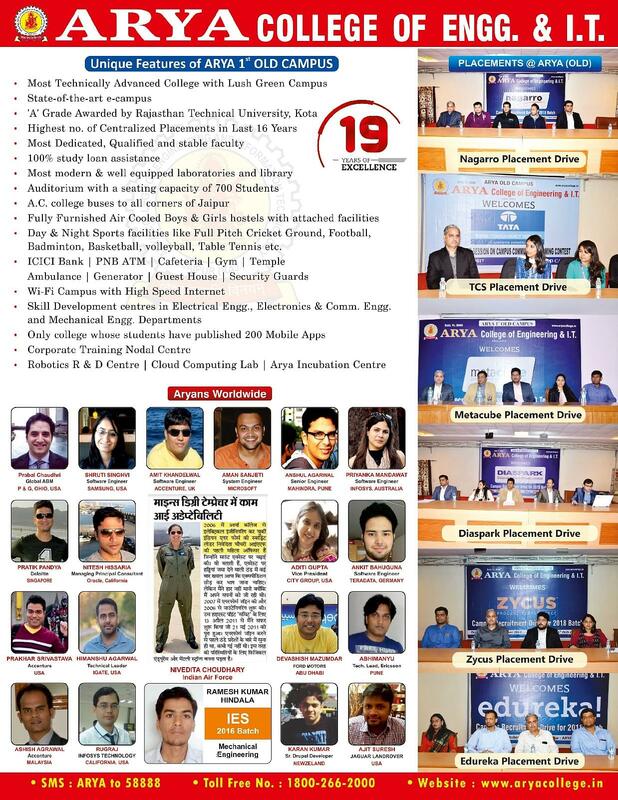 Arya College of Engineering and IT is affiliated to Rajasthan Technological University (RTU), Kota. The college offers undergraduate and postgraduate courses in engineering and management. Admissions at Arya College of Engineering and IT (ACEIT) to these courses are conducted every year. The college aims to become a leading Institute delivering Technocrats, Managers, and Entrepreneurs capable of transforming India into a “Technological and economical Superpower” besides establishing itself as an Educational Hub of worldwide acclaim. 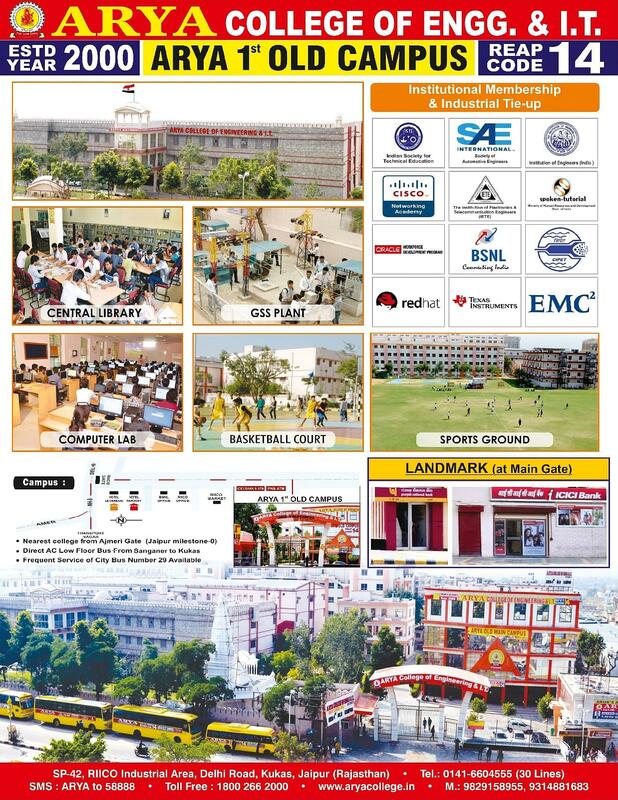 The college has MoUs with Oracle, RedHat, CISCO and EMC2. A plethora of extracurricular activities including workshops and PD sessions. Most Technically Advanced College of North India. B. Tech It is a four-year full-time course. 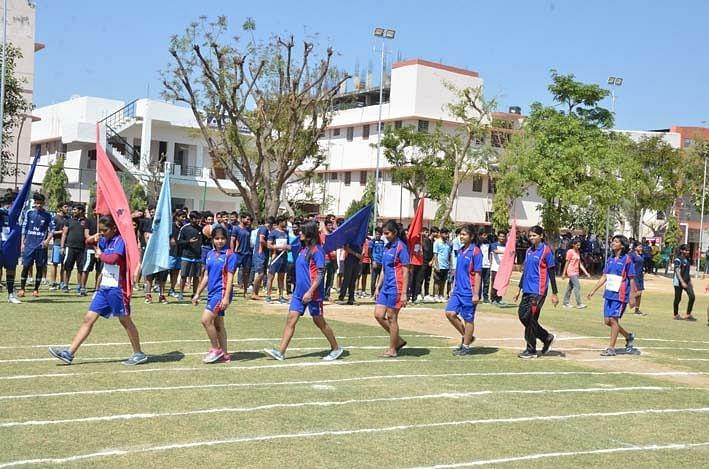 It is offered in the following specializations Electronics and Communication Engineering, Mechanical Engineering, Electrical Engineering, Mechanical Engineering, Computer Science and Engineering, and Information Technology. Eligibility- The candidate needs to have passed 12th standard from a recognized board. The candidate is required to have a valid score in REAP/ JEE Mains. M.Tech It is a two-year full-time course. It is offered in the following specializations- Electronics and Communication Engineering, Electrical Engineering, Electronics, and Communication Engineering. Eligibility- The candidate should have a degree in B.Tech/ B.E. from a recognized university. Candidates having an M.Sc./MCA degree are required to have a valid GATE score. MBA It is a two-year full-time course. It is offered in the following specializations- Finance, HR, Marketing and Information Technology. Eligibility- The candidate is required to have a Bachelor’s degree from a recognized university. Arya College of Engineering and IT (ACEIT) Courses and Fee Structure, click here. The placement cell at Arya College of Engineering and IT believes in providing students with the best training to facilitate the placement process. Students are prepared to face the challenging interviews. 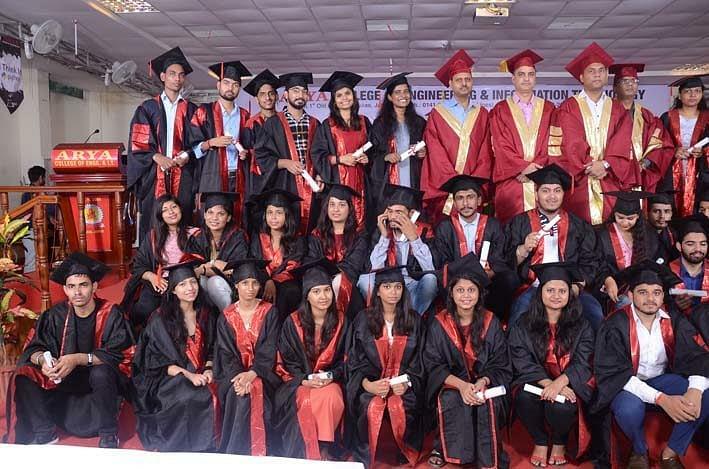 For the batch of 2019, more than 75% of the students got placed in top companies. Top recruiters included Google, Microsoft, TATA, IBM, Samsung, Amazon, Barclays, Hero, Adobe, Tech Mahindra, HCL, Dell, etc. Google offered a student a package of one crore per annum. For more information on Arya College of Engineering and IT (ACEIT) Placements, click here. Overall it's a good college if you are searching for a college to learn and to get placed in a reputed company. Its infrastructure, social life, labs, lawns, hostels classes, faculties, library all are very good. Shooloni university is best here's faculty and all infrastructure r very gd and up to date. Arya College of engineering & IT has made a very good reputation in a short span of time. I think it is the best place for studying as it has a great atmosphere for students. The campus is spacious and well built, and for outsiders, hostel facility is also available. 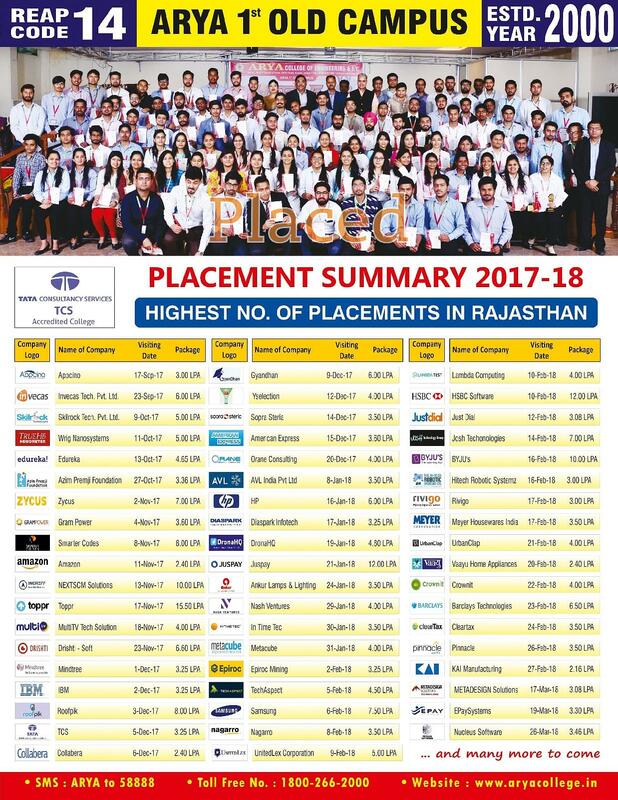 The College Campus placements are also better than other colleges or universities. Many multinational companies come here for placements every year. The students just have some Problems due to the discipline they follow. Good.. by my side 100/100 numbers for arya college, because the provide higher studies with best complaints. College management is amazing on the whole. I like it. Though I'm not completely satisfied on the whole, it is good. 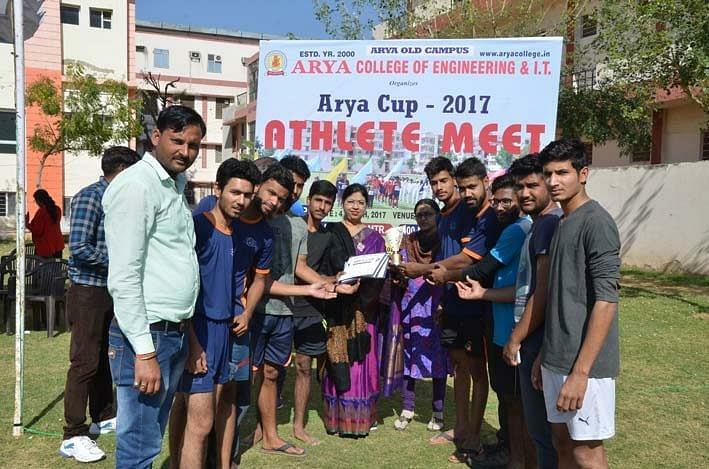 "Arya College of engineering & IT has made a very good reputation in a short span of time. I think it is the best place for studying as it has a great atmosphere for students. The campus is spacious and well built, and for outsiders, hostel facility is also available. The College Campus placements are also better than other colleges or universities. Many multinational companies come here for placements every year. The students just have some Problems due to the discipline they follow." 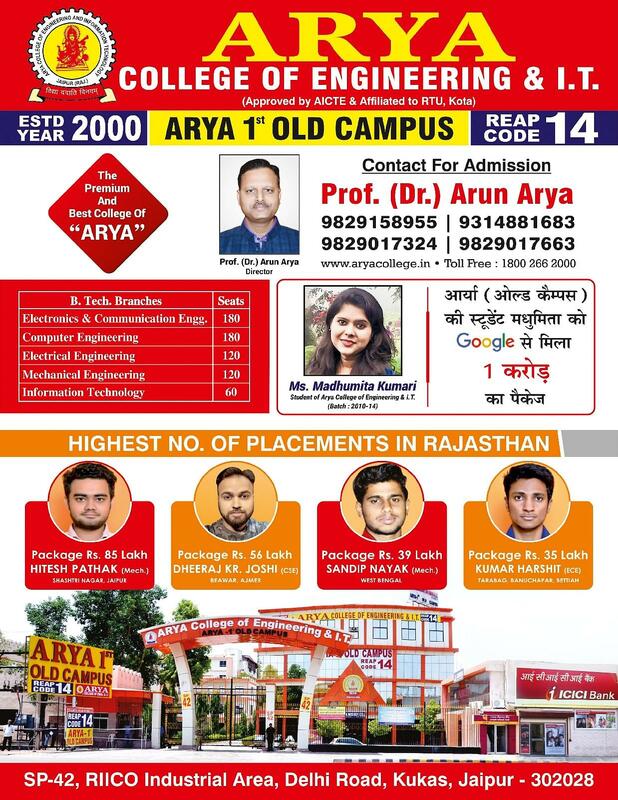 "My college is one of the best college in Rajasthan"
Because it is one of the best colleges in Rajasthan for Computer Science branch. Its placement record is also impressive. The academics, extracurricular activities, etc. everything is a good year. I found ACEIT as a complete package which a student desires.